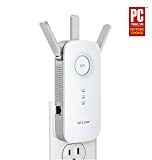 Each item on this dual-band WiFi range extenders list has external antennas to help boost your router’s WiFi connections (2.4GHz and 5GHz), a compact wall-plug design, and a 1 Gigabit Ethernet port for fast wired connections to devices far away from your router (computers, TVs, gaming systems, more). Some also have speed boosting features such as beamforming technology and MU-MIMO technology, along with other user-friendly features, and they are all compatible with any router. See details and compare dual-band WiFi range extenders below, to find out how they can help to speed up your home network’s WiFi in some areas, while also extending the WiFi range of your router over greater distances and into hard-to-reach areas of your home or office. a compact wall-plug design (no extra cables necessary). Further details (specs, usage info, setup videos) for each dual-band WiFi range extender can also be found below this list. dual band WiFi (802.11 ac/n/g/a/b). 4×4 MU-MIMO (simultaneously send data to up to 4 devices). Antennas: 4 external antennas (fixed), covers up to 14,000 sq. ft.
Wireless Modes: WiFi Range Extender, Access Point. Wireless Security: WPA2, WPA, 64/128-bit WEP. Beamforming: Targeted Wi-Fi for stronger connections. dual band WiFi (802.11 ac/n/g/a). 4×4 MU-MIMO (simultaneously send data to multiple devices). Antennas: 4 external antennas (adjustable). dual band WiFi (802.11 ac/n/g/b). 3×3 MU-MIMO (simultaneously send data to up to 3 devices). Wireless Security: WPA2-PSK, WPA-PSK, 64/128-bit WEP. Wireless Functions: Wireless Statistic, Concurrent Mode dual-band boost, Access Control, LED Control, Domain Login Function. Antennas: 3 external antennas (adjustable). Antennas: 3 external antennas (adjustable), covers up to 10,000 sq. ft.
Wireless Modes: WiFi Range Extender. Wireless Functions: Wireless Statistic, Concurrent Mode boost, Access Control, LED Control, Domain Login Function, High Speed Mode. MU-MIMO (simultaneously send data to up to multiple devices). Antennas: 2 external antennas, covers up to 10,000 sq. ft.
Wireless Security: WPA2, WPA, WEP. Wireless Modes: WiFi Range Extender, Access Point, Router (for creating an instant private wireless network). More information is listed below about each WiFi range extender’s wireless features, user-friendly features, system requirements and other details including how-to videos for comparison on how easy (or difficult) they are to setup. The TP-Link RE650 or TP-Link AC2600 Wi-Fi range extender features an Intelligent Signal Indicator light (helps find the best location for the Wi-Fi range extender), 4x4 MU-MIMO (simultaneous data transfer to up to 4 devices for 4x faster performance), beamforming technology (device-targeted Wi-Fi for stronger connections) and more features listed below. Intelligent Signal Indicator: Find the best location to place the TP-Link AC2600 (blue = good location/connection to router, red = connected but too far from router, blinking = WPS connecting, off = no connection). 2.4GHz: Indicates connection to 2.4GHz router Wi-Fi network on/off. 5GHz: Indicates connection to 5GHz router Wi-Fi network on/off. Power: Indicates if Wi-Fi extender is on/off or starting up (blinking). Buttons: WPS (for Wi-Fi Protected Setup connection), LED (turn on/off range extender lights), Reset, Power. Network/Device Management: TP-LINK Tether App can be used to access and manage your network with an iOS or Android mobile device. Ports: 1 Gigabit Ethernet port (10/100/1000M, RJ45). Antennas: 4 fixed external antennas for coverage of up to 14,000 square feet. Wi-Fi Speeds: Up to 2533 Mbps maximum combined speed, for dual band Wi-Fi (802.11 ac/n/g/a/b) at 2.4GHz (800 Mbps) and 5GHz (1733 Mbps). 4 x 4 MU-MIMO technology allows the TP-Link RE650 to simultaneously send data to up to 4 devices. Dual band Wi-Fi (802.11 ac/n/g/a/b). Beamforming technology targets Wi-Fi to devices for stronger connections. Wall-plug design (no extra cables necessary). Dimensions: 163 x 86 x 40 mm (6.4 x 3.4 x 1.6 in). System Requirements: Wi-Fi router or gateway (802.11 ac/n/g/a/b), Microsoft Windows, Mac OS, NetWare, UNIX or Linux. Power Consumption (Maximum): 12 W.
The D-Link DAP-1860 or D-Link AC2600 Wi-Fi range extender features a Wi-Fi Signal Strength Indicator light (helps find the best location for the Wi-Fi range extender), 4x4 MU-MIMO (simultaneous data transfer to up to 4 devices for 4x faster performance), beamforming technology (device-targeted Wi-Fi for stronger connections) and more features listed below. Wi-Fi Signal Strength Indicator: Find the best location to place the D-Link AC2600 (3 green = best location/connection to router, 2 green = good location/connection, 1 green = weak location/connection, 1 amber = very weak location/connection). Buttons: WPS (for Wi-Fi Protected Setup connection), Reset, Power. Network/Device Management: QRS Mobile App can be used for setup and configuration with an iOS or Android mobile device. Antennas: 4 adjustable external antennas. Wi-Fi Speeds: Up to 2532 Mbps maximum combined speed, for dual-band Wi-Fi at 2.4GHz (800 Mbps) and 5GHz (1732 Mbps). 4 x 4 MU-MIMO technology allows the D-Link DAP-1860 to simultaneously send data to multiple devices. Dimensions: 158 x 76 x 70 mm (6.25 x 3.0 x 2.75 in). System Requirements: Wi-Fi router or gateway (802.11 ac/n/g/a), Microsoft Windows 10/8/7/Vista, Mac OS X 10.6 or higher. The TP-Link RE500 or TP-Link AC1900 Wi-Fi range extender features an Intelligent Signal Indicator light (helps find the best location for the Wi-Fi range extender), 3x3 MU-MIMO (simultaneous data transfer to up to 3 devices for 3x faster performance), beamforming technology (device-targeted Wi-Fi for stronger connections) and more features listed below. Intelligent Signal Indicator: Find the best location to place the TP-Link AC1900 (blue = good location/connection to router, red = connected but too far from router, blinking = WPS connecting, off = no connection). Wi-Fi Speeds: Up to 1900 Mbps maximum combined speed, for dual-band Wi-Fi at 2.4GHz (600 Mbps) and 5GHz (1300 Mbps). 3 x 3 MU-MIMO technology allows the TP-Link RE500 to simultaneously send data to up to 3 devices. System Requirements: Wi-Fi router or gateway (802.11 ac/n/g/b), Microsoft Windows 10/8/7/Vista/XP/2000/NT/98SE, Mac OS, NetWare, UNIX or Linux. 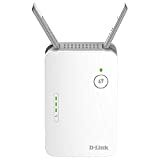 The D-Link DAP-1720 or D-Link AC1750 Wi-Fi range extender features a Wi-Fi Signal Strength Indicator light (helps find the best location for the Wi-Fi range extender) and more features listed below. Antennas: 3 adjustable external antennas. Wi-Fi Speeds: Up to 1750 Mbps maximum combined speed, for dual-band Wi-Fi at 2.4GHz (450 Mbps) and 5GHz (1300 Mbps). Dimensions: 133 x 196 x 114 mm (5.25 x 7.75 x 4.50 in). System Requirements: Wi-Fi router or gateway (802.11 ac/n/g/a), Microsoft Windows 10/8.1/8/7, Mac OS X 10.7 or higher. The TP-Link RE450 or TP-Link AC1750 Wi-Fi range extender features an Intelligent Signal Indicator light (helps find the best location for the Wi-Fi range extender), and more features listed below. Intelligent Signal Indicator: Find the best location to place the TP-Link AC1750 (blue = good location/connection to router, red = connected but too far from router, blinking = WPS connecting, off = no connection). Buttons: RE Button (for router connection), LED (turn on/off range extender lights), Reset, Power. Antennas: 3 adjustable external antennas for coverage of up to 10,000 square feet. Dimensions: 163 x 76 x 66 mm (6.4 x 3.0 x 2.6 in). System Requirements: Wi-Fi router or gateway (802.11 ac/n/g/b), Microsoft Windows 10/8.1/8/7/Vista/XP/2000/NT/98SE, Mac OS, NetWare, UNIX or Linux. 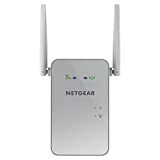 Power Consumption (Maximum): 9 W.
The NETGEAR EX6150 or NETGEAR AC1200 Wi-Fi range extender features router/client indicator lights (helps find the best location for the Wi-Fi range extender), MU-MIMO (simultaneous data transfer to multiple devices faster performance), and more features listed below. Router Link LED: Indicates connection status between the extender and the router or access point (green = best connection, amber = good connection, red = poor connection, off = no connection). Client Link LED: Indicates Wi-Fi connection status between the extender and a device (green = best connection, amber = good connection, red = poor connection, off = no connection). WPS: Indicates WPS connection status (solid green = Wi-Fi security enabled, blinking green = WPS connection in progress, off = no connection). Power: Indicates power status of the Wi-Fi extender (green = on, amber = starting up). Buttons: WPS (for Wi-Fi Protected Setup connection), Mode Switch (Extender or Access Point), Power. Network/Device Management: NETGEAR WiFi Analytics App. Wi-Fi Speeds: Up to 1200 Mbps maximum combined speed (FastLane technology), for dual-band Wi-Fi at 2.4GHz (300 Mbps) and 5GHz (900 Mbps). MU-MIMO technology allows the NETGEAR EX6150 to simultaneously send data to multiple devices. Dimensions: 122 x 74 x 38 mm (4.8 x 2.9 x 1.5 in). System Requirements: Wi-Fi router or gateway (802.11 ac/n/g/a/b). 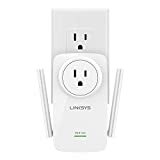 The Linksys RE6700 or Linksys AC1200 AMPLIFY Wi-Fi range extender features a 3.5 mm audio jack for audio streaming to connected speakers, an integrated power outlet, beamforming technology (device-targeted Wi-Fi for stronger connections) and more features listed below. WPS: Indicates WPS connection status (solid for 10 seconds = WPS connection successful, flashing quickly = WPS connection not successful, flashing slowly = WPS connection in progress. Spot Finder Technology: Use your smartphone, laptop, or tablet to help find the best location for the Wi-Fi range extender. Integrated Power Outlet: Plug in other devices through the Linksys RE6700. Works like a normal outlet. Buttons: WPS (for Wi-Fi Protected Setup connection), Reset. Ports: 3.5 mm audio jack (stream audio from another device through connected speakers), 1 Gigabit Ethernet port (10/100/1000M, RJ45). Wi-Fi Speeds: Up to 1167 Mbps maximum combined speed, for dual-band Wi-Fi at 2.4GHz (300 Mbps) and 5GHz (867 Mbps). Dimensions: 121 x 87 x 63 mm (4.75 x 3.4 x 2.5 in). System Requirements: Wi-Fi router or gateway (802.11 ac/n/g/a/b), Microsoft Windows, Mac OS. The Persevere AC1200 Wi-Fi range extender features 2 Gigabit Ethernet ports, a Router mode, a Wi-Fi Signal Strength Indicator light (helps find the best location for the Wi-Fi range extender), and more features listed below. Wi-Fi Signal Strength Indicator: Find the best location to place the Persevere AC1200 (3 bars = strong reception, 2 bars = good reception, 1 bar = weak reception). Buttons: WPS (for Wi-Fi Protected Setup connection), AP/Router/Repeater Switch, Reset. Ports: 2 Gigabit Ethernet port (10/100/1000M, RJ45), WAN port, LAN port. 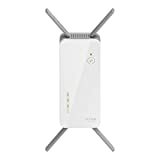 The TP-Link RE355 or TP-Link AC1200 Wi-Fi range extender features an Intelligent Signal Indicator light (helps find the best location for the Wi-Fi range extender) and more features listed below. Intelligent Signal Indicator: Find the best location to place the TP-Link AC1200 (blue = good location/connection to router, red = connected but too far from router, blinking = WPS connecting, off = no connection). 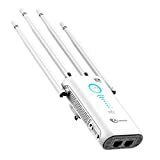 The D-Link DAP-1620 or D-Link AC1200 Wi-Fi range extender features a Wi-Fi Signal Strength Indicator light (helps find the best location for the Wi-Fi range extender) and more features listed below. Wi-Fi Signal Strength Indicator: Find the best location to place the D-Link AC1200 (3 green = best location/connection to router, 2 green = good location/connection, 1 green = weak location/connection, 1 amber = very weak location/connection). Dimensions: 53 x 63 x 95 mm (2.1 x 2.5 x 3.75 in).